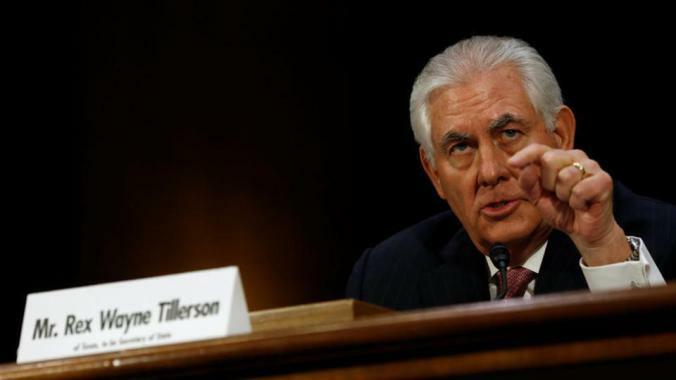 "Secretary of State Rex Tillerson is cleaning house at the State Department, according to a report. Staffers in the offices of deputy secretary of state for management and resources as well as counselor were shown the door Thursday, according to CBS News. Many of those let go were on the building’s seventh floor — top-floor bigs — a symbolically important sign to the rest of the diplomatic corps that their new boss has different priorities than the last one. The staffing changes came as Tillerson was on his first foreign trip — attending a G-20 meeting in Bonn, Germany. “As part of the transition from one administration to the next, we continue to build out our team. The State Department is supported by a very talented group of individuals, both Republicans and Democrats,” State Department spokesman RC Hammond told CBS." ""The mainstream media seemed far more interested in obfuscating the details regarding the Tillerson terminations than they were in covering what could be one of the most dangerous intelligence leaks in years, of which there has been but a peep out of any major news outlet. Captain Joseph R. John (Navy-Ret.) has stated that he believes the Muslim Brotherhood “fifth column” has “infiltrated U.S. Government,” and if he is correct, the Awan brothers could very well be a part of this infiltration. Yet, there as been but a peep of information about the Awan brothers from nearly all major news outlets. Are they in jail? What are they accused of? Does the Trump administration suspect them of leaking details about military operations to terrorist organizations? And most importantly, if so, did these three men directly or indirectly contribute to the death of Owens during the Yemen raid? One thing is for certain – as Politico seemed to take delight in stating, “Trying to nail down who the leakers are is like trying to count the cockroaches under the couch.” However, it seems most of the “leaks” are coming from Obama holdovers. Which makes Tillerson’s “cleaning house” look like not just the correct move, it leaves you wondering if he did enough cleaning house.""